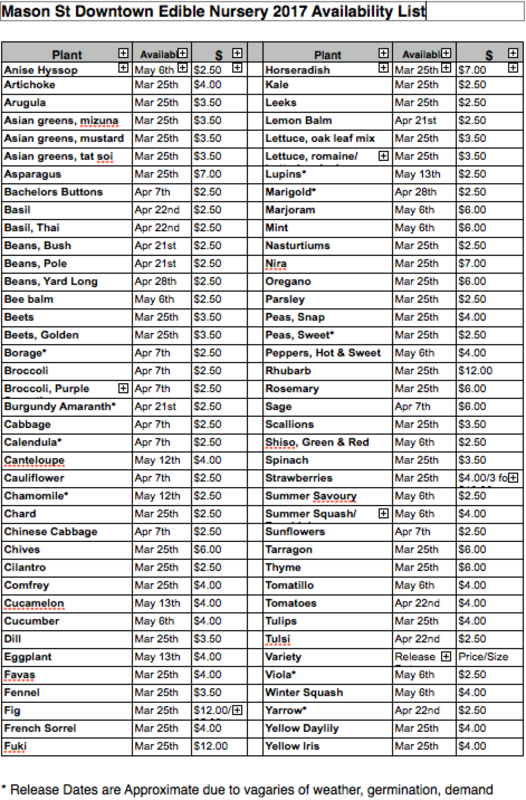 See our plant list from the 2017 season near the bottom of this page to get an idea of the range of plants we sell. We grow the widest variety vegetable, herb and edible flowers that we can in our small space, and every year we try something new! If there’s a plant that you think we should be growing, please get in touch and let us know. We’d love to give it a try if we haven’t already. 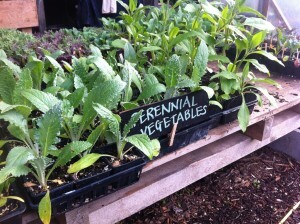 From March to the end of June, our Edible Nursery is open every Friday from 2 pm to 6 pm and Saturdays from 10 am to 2 pm. The entrance is at 1015 Balmoral Rd. You’ll also find us at the annual Compost Education Centre, which usually takes place in May. All of our plants are grown on-site at our Mason St farm, using the tried & true methods of good potting soil, organic amendments, and careful attention. We pride ourselves on selling plants that are healthy and hardened off. If we sell it, you can plant it. In 2016 & 2017 we partnered with the Victoria Seed Library to grow a selection of their favourite tomato, pepper and bean varieties. Our hope is that by providing these plants to our customers, we can encourage the growth of the seed-saving community in our region! At the Mason St. Edible Nursery we want to support your community project! If you are local project with a social mission, and could use some healthy discounted plant starts, please get in touch with us. We’d love to see what we can do to help you get an abundant harvest. Please contact us for more information.